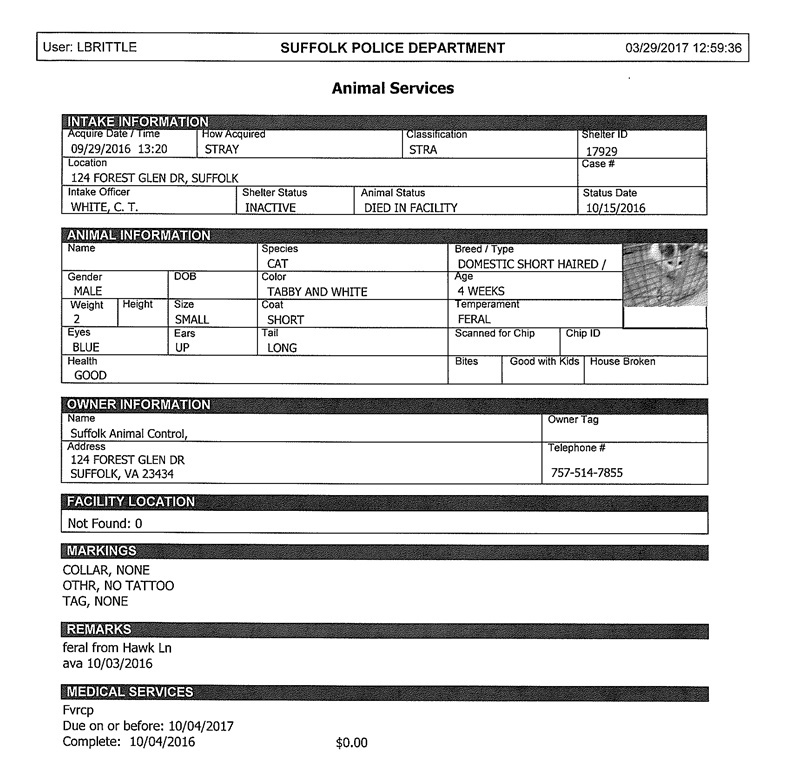 Last week I reported about all the kittens PETA rounded up and took to the Peninsula Regional Animal Shelter in Newport News, VA, to be killed. PETA logged them as “live releases,” but only two (out of 20) were spared. Among the dead were unweaned neonatal kittens, six week old kittens, eight week old kittens, four month old kittens, seven month old juveniles, one year old juveniles, and adult cats. They were listed as having no illness or injuries. Some of them were killed within minutes. Tragically, PRAS isn’t the only regressive pound PETA sends kittens to kill. PETA sent three kittens to the pound run by the Suffolk, VA, police department: a three-month old kitten and two kittens listed as “4 weeks old” (although they appear to be closer to eight weeks old). All three are now dead. 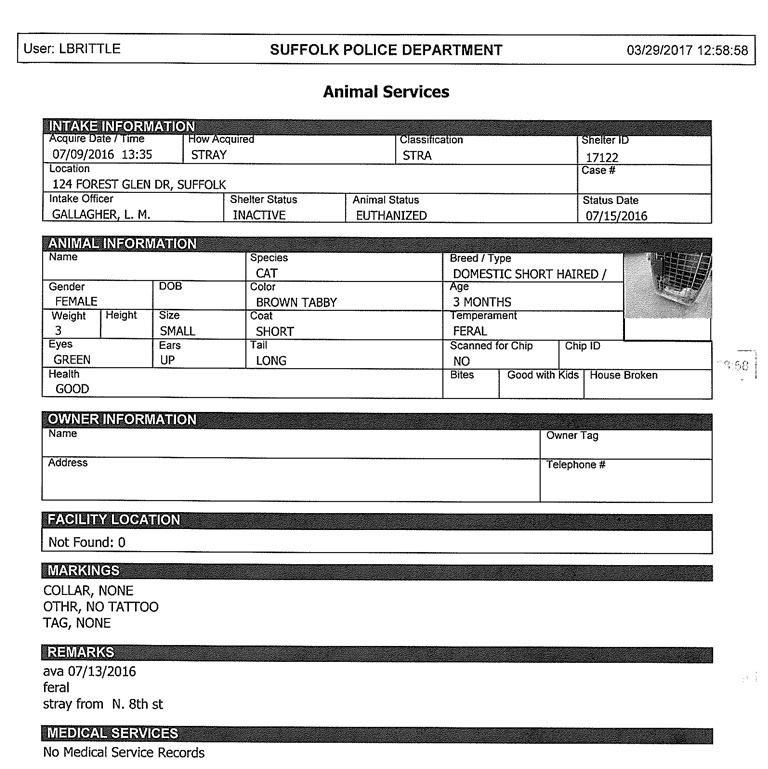 The two baby boys were also listed in “good” health, at least until PETA and the Suffolk pound got their hands on them. They were both subsequently found dead in their cages. It is imperative that all incoming kittens are vaccinated immediately, preferably in the lobby of a shelter rather than in the group housing area. Since the vaccine works immediately, waiting even an hour can be the difference between life and death. Once a cat or kitten is exposed to the disease without a vaccine on board, the vaccine can do nothing to protect the cat/kitten from the virus and its effects even if given immediately after exposure. The kittens were not vaccinated for almost a week. The question, of course, is why? 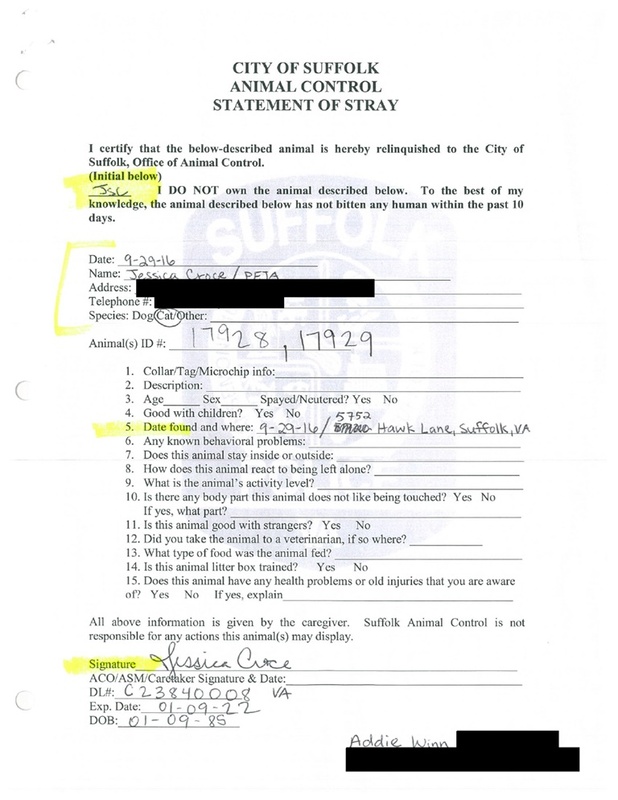 As to why Suffolk Animal Services did not vaccinate on intake, sterilize and release them, or send them into foster care for socialization and adoption: Lack of caring. Since Suffolk kills the majority of cats it takes in, every interaction they have with those animals is influenced by the perception that their lives do not matter, that their lives are cheap and expendable, and that they are destined for the garbage heap. Among the Suffolk Police Department’s listed core values are “providing the highest level of assistance to those in need, demonstrating our compassion and sensitivity to the needs of our community,” ensuring “each employee is an ambassador of our profession and each citizen contact reflects our commitment to quality,” promoting “innovation and initiative to solve ongoing community problems,” “safeguarding the public trust by our dedication to values that promote honesty, ethical behavior and treating others as we would want to be treated,” and offering “superior performance in service to our community.” None of that was in evidence here. As to why PETA uses donations to round up and kill healthy community kittens and cats, rather than use its immense resources — over $50,000,000 per year in revenues — to care for them, socialize them, rehome them, or sterilize and release them: Employees who have spoken out about PETA’s killing say it is the result of the deeply disturbing version of animal activism promoted by PETA founder and President, Ingrid Newkirk. When you donate to PETA, you pay to round up and poison kittens.